At the end of May we made a trip to Denmark. We mostly stayed on the countryside, but we also went to Copenhagen for a day. It was very rainy and we decided that since we didn’t have much time, we wanted to hop on a tourist bus to see some sights. We walked through the city, looking for a bust stop. We ended up in the tourist information where we changed our mind from bus to boat because the weather had cleared up. On our way to that boat I bought some dark rye rolls because F. had declared that she was hungry. I had seen those dark brown, almost black rolls in many bakeries in Copenhagen, and I had no ideas what to expect. They looked very dyed and very different from German rye rolls, which are usually made from rye flour and rye sourdough. If you are lucky. 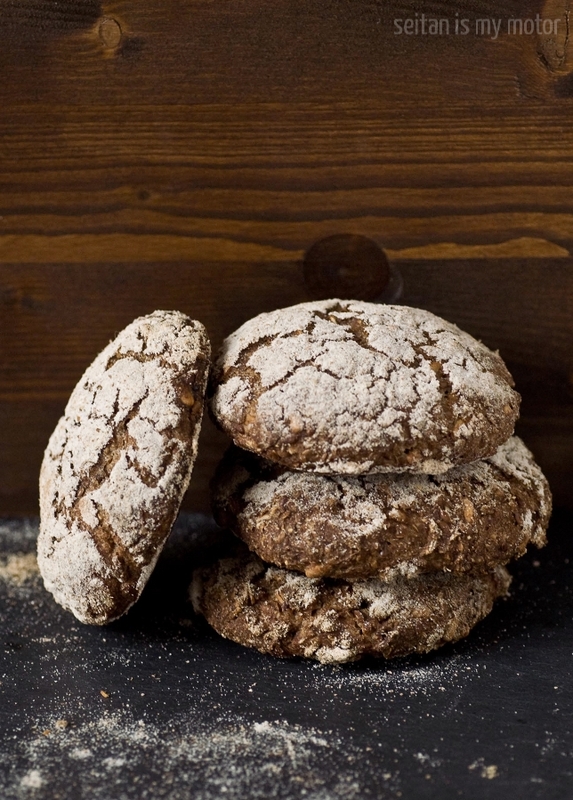 Often they are made with rye and wheat and are also slightly dyed (with malt) to give the customer the impression of buying a real rye roll. Usually they are not whole grain. The Danish rolls looked very rustic, made with course flour and they had seeds on top. F. and I both tried a piece and they were so good! They were like my favourite bread in roll form. They were probably made with sourdough, but a very mild one. The crumb was full of cracked grains and seeds, they were moist and slightly fluffy, but also dense from all those kernels. I really had no idea you could make this kind of roll. They were so good, they really should be the Danish national dish. (Maybe they are?) I had never seen or eaten something like that in Germany and I couldn’t wait to figure out how to make my own. When we returned to our sommerhus I spent a whole evening searching for recipes on the internet. I found several recipes that used the same bread recipe for their rolls. That recipe is from a book called Meyers bageri, which is full of great bread recipes. I wasn’t able to find that book in the small town we were staying, so I got another one, which also included the recipe I was looking for. It is by the same author (Claus Meyer) and simply called Bagebog (baking book). This very large and heavy Danish (2.2 kg!) cookbook includes 200 recipes for bread, cakes, cookies, and pastries (e.g. wienerbrød aka, Danish pastries) and many of them are, at least as far as I could judge, traditional ones. It is a very good quality hard cover book, printed on sturdy paper and with many gorgeous pictures. I already marked so many recipes I want to try, so be prepared to find some more Danish foods on this blog soon. Before I found this book, I had lost my bread baking motivation and inspiration. But as soon as we were back from our vacation I made a new sourdough starter and sprouted some rye which I needed for this rather involved bread baking project called mørke rugboller (dark rye rolls). I had to sprout the grains, because I needed some roasted malt. 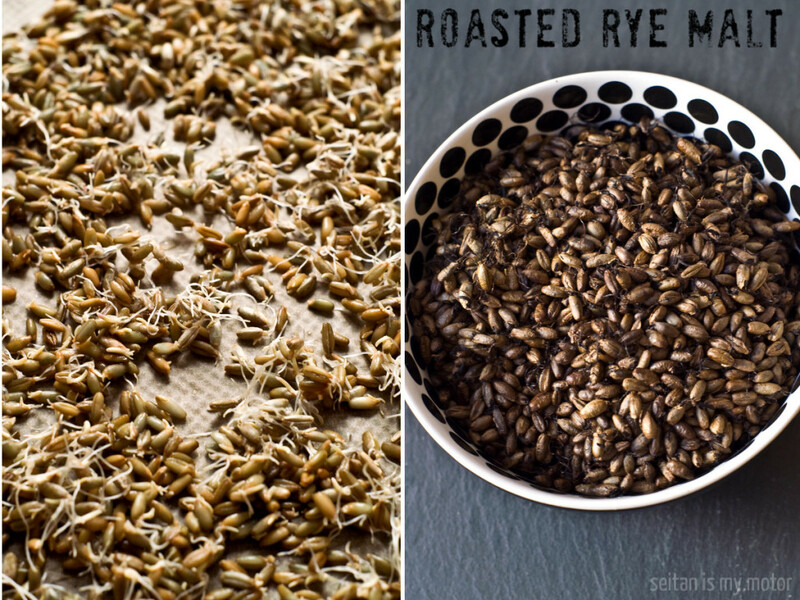 Roasted malt is used for dyeing breads (or beer) and it is made from sprouted and then roasted or better, burnt grains. I probably could have bought this online, but since I had made my own diastatic malt powder before, I thought I’d just make my own. I sprouted 100 g of rye kernels for 48 hours. Then I placed the sprouts on a baking sheet and let them dry for 8 hours. This isn’t necessary, I just did it, because I had to go to work and I wanted the kernels to stop sprouting. I baked them at 150°C for about 20-30 minutes, until they were burnt. Then I let them cool and ground them in a floor mill. I also made a batch of regular diastatic malt, also from 100 g of rye kernels (usually it is made from barley). For this malt, the kernels were baked at 50°C until they started to brown slightly. Diastatic malt powder is used to improve enzyme activity while the bread is fermenting. That means more sugars are produced and the bread browns more easily and gets a sweeter taste. Even though Meyer’s recipe only calls for roasted malt, I used both a teaspoon of roasted and a teaspoon of diastatic malt powder in my recipe. 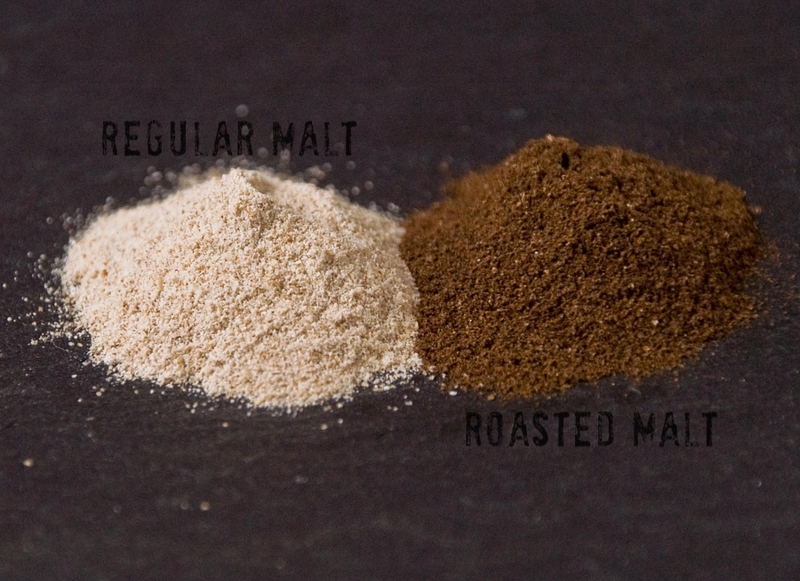 Please keep in mind that you don’t have to make your own malt for this recipe or go out of your way to buy some. You can easily leave it out. Okay, now back to the recipe. It is really great. I baked those rolls and they came out almost exactly like I remembered them. They are crispy on the outside like any good roll, and they are so moist and bursting with aroma both from the long fermentation and the baked grains and seeds. These are full of nutritious stuff and keep you going for some time. Since they are so full of seeds and cracked rye, they do store a lot of water. That means they seem to bee slightly too wet after baking. For this reason you should let them sit for a couple of hours before eating them. And they will definitely be great the next day, too. I should say that this is not the best recipe for beginning bakers. Rye doughs can be a bit difficult to handle. They are sticky and they do behave differently from wheat doughs. They don’t rise that fast, especially when made with sourdough and it can be hard to proof them correctly. I thought that this recipe was very easy to handle, but I might have had some problems a couple of years ago. The dough also needs some preparation time. Most of it is inactive, but you need to keep in mind that the sourdough needs time to ferment and rise. The original recipe makes three loaves. I only made enough for one loaf and got 10 rolls. I also made a few changes: The recipe calls for a sourdough starter that is in fact a preferment. I used my regular rye starter instead. I also thought the recipe called for way too much salt, so I reduced that. I think next time I will use even less. Place ingredients in a bowl. Mix with a wooden spoon or your hands. You should get a stiff and sticky dough. Cover and let rise for 12 hours. Blend all ingredients together, cover and let sit for 12 hours as well. Place starter and soaker in a bowl. Mix water and yeast and add to the starter mixture along with the remaining ingredients. Knead very well with your hands. This is just to distribute the ingredients evenly. Since this is a rye dough it won’t change its texture and will not get firm and tacky like a wheat dough. Line two baking sheets with parchment paper. Form the dough into 10 equally sized balls. This works best with wet hands. Place them on the baking sheets and press down slightly. Generously dust with flour. (This will help the dough not to dry out while it is rising.) Cover with a dry kitchen towel. Let rest for 2-21/2 hours. Preheat the oven to 200°C. Bake one sheet at a time. Bake for 35 minutes. Let cool completely. Serve after a couple of hours. I’m so excited to begin baking again! In a month or so, we’ll finally have all our household goods. Once they arrive, I can begin to “nest.” You’ve inspired me to give all your fabulous recipes a whirl. I also must get the book you spotlighted, Vegan Whole Grain Baking. Now that I’m here in Germany, I understand how rich, flavorful and tasty the bread is. We recently picked up a loaf of Fitness-Brot in the local bakery and I fell in love with it’s texture, taste, and seed variety. We have bread similar in the States but it’s different here (fresher, better texture, better flavor, etc.). I’d love to master the art of baking German bread and “veganizing” the pastry’s and popular dishes that everyone seems to think we’re missing out on because we’re vegan. I’m sure it will probably take time, a little studying, and lots of practice.